The end of a season is a bittersweet time for anime fans, as the joy of seeing a series reach its climax is undercut by the knowledge that this is the last hurrah for a story we’ve grown attached to over time. Such is the case with Shin Sekai Yori (From the New World,) a series that had me under its spell from the first episode on. Unpredictable, challenging and artistic are but three ways to describe the experience of watching it. Indeed, it has all the things that critics like me love to see in anime, but more importantly, this isn’t merely a cold essay on human nature, it’s emotive, and ends beautifully, with a trademark mix of the horrifying and hopeful. I’m a pretty big fan of George R. R. Martin’s still ongoing A Song of Ice and Fire series. When comparing that to Tolkien’s fifties-era The Lord of the Rings trilogy, a friend mentioned that one of the main differences is the depiction of good and evil. In Tolkien’s books, Sauron is the clear antagonist, evil incarnate. There’s a clear dividing line between him and the Fellowship, 2 sides, vying to save or destroy the world. In A Song of Ice and Fire, there’s more like 5 sides fighting against each other for little more than bragging rights. It’s massively complex in comparison to The Lord of the Rings, but is also a story more relevant to our generation. 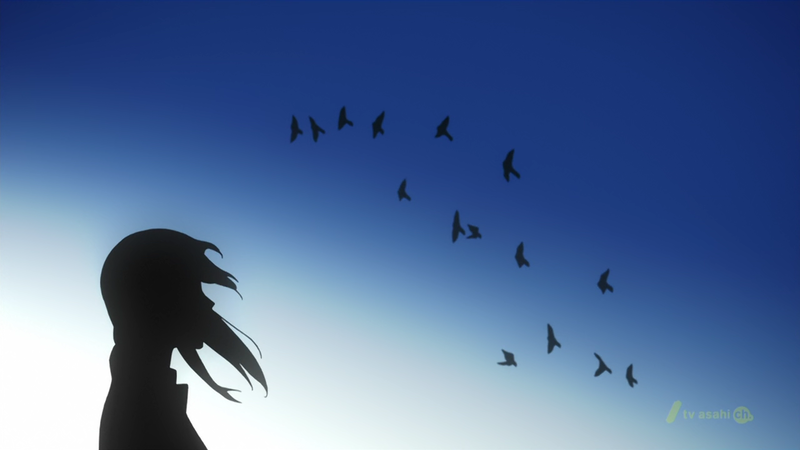 With the way it ends, the same could be said of Shin Sekai Yori. The queerrats become the antagonists in the second half of the story by invading human villages. They are ugly, inhuman and show no mercy. We fear them as much as the characters do, and when they are finally defeated, I caught myself breathing a sigh of relief, but what comes next is horrifying. The queerrats’ leader, Squealer, is put on trial for his war crimes, and, quite frankly, his reasons for fighting make sense. The queerrats have been treated like slaves, forced to comply or face the extinction of their colonies. As Squealer says, it isn’t that they hate humans, but rather, how can an intelligent species be expected to thrive when even the tiniest of transgressions could mean the end for them all? Thinking right back to the beginning of the series, Saki and co. come across a queerrat drowning in a stream: Saki saves him, but, more importantly, the others were quite happy to just keep on walking. Stripped naked and put on trial, Squealer screams at the judge that he is human. Everyone in the room just laughs. He’s then bound by their Cantus’ (telekinesis,) and sentenced to ‘Eternal Hell,’ a disgusting form of torture that deforms his body yet forces him to keep living, experiencing excruciating pain in his every waking second. 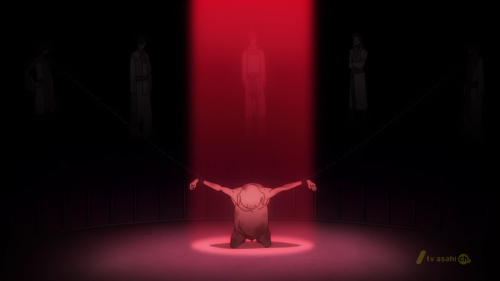 Him screaming “My name is Squealer” is as haunting as it is sad, and comes to symbolise Shin Sekai Yori’s parting shot. Hostilities may have ceased, but the war is far from won. Squealer was their equal, an intellectual and brave individual, rewarded with nowt but serfdom, indignity and torture. He deserved his freedom. From that, we’re left with Saki and Satoru. They get married, she falls pregnant. She might now be the village leader. Have they learnt from past mistakes? As laughter echoes around their old school, that’s left for us to contemplate. Like Legend of the Galactic Heroes before it with Mittermeyer’s last line, “you too, Felix?”, all of our hopes for a better future are left in the hands of our children. The power of imagination is what changes everything. While I agree with a part of what you wrote, I think the situation is a lot more complex here. Squealer was a revolutionary, yes. He also constantly lied, he betrayed those who trusted him (and even those whom he owed his life), he lobotomized his queen and mother and turned her into a baby-factory, something that ended up the fate of many other queens/mothers as well. He exploited the mutant queen of the Tsuchigumo colony to create mutants of his own kind for the sake of using them in war (from the small, twig-like bakenezumi and the exploding “dogs” to the huge dolphin-like ones), he sent hundreds if not thousands of his own kind to their deaths, and his plan was not equality – it was genocide and enslavement. Oh, his reasoning was sound from an evolutionary standpoint. But does it really justify everything? For someone who resented being at the mercy of humans, he planned the genocide of humans as a species. For someone who hated being treated as a slave (and perhaps the jury is still out on that), he was quite happy to enslave and exploit not only helpless human children but his own kind as well. All for a good cause? These are all valid points, there’s no winners in war, everyone gets their hands bloodied. Even still, Squealer has more of the moral high ground. Although his methods were crude, I don’t think you can blame him for switching from a monarchy to a more modern style of government (I don’t think it’s democracy, more like an oligarchy,) indeed, it’s pretty ironic that Satoru reprimands him for it, whilst we’re obviously privy to his people’s own revolution against their king all those years ago. It was humanity’s error that brought us to this point. Certainly, though, Squealer was tainted by the era and is willing to repeat horrible things to get what he wants. He was an extremist, no doubt. I guess the hope is that the next generations of both races will be less intolerant. And as for a modern style government, well, it’s not like the human society is a monarchy? They’re led by councils and committees. The revolution you mention wasn’t against monarchy but more like against people without PK against people with PK who oppressed and terrorized them (in ways that Satoru’s society wouldn’t think of doing to the rats). And it was more than half a millennium ago. Kiroumaru was an interesting case, and reminded me of a Bakumatsu-era samurai clinging to an out-dated sense of morality. Although he was a very reliable, loyal person, the era needed someone like Squealer prepared to get his hands mudied and shake the queerrats out of their oppression. Nothing would change under Kiroumaru, he was too willing to compromise. This isn’t me justifying genocide or anything like that, but there’s probably a happy medium to be found between the 2. Keeping with the LOGH reference, Squealer was Oberstein to Kiroumaru’s Lohengramm. But I think the difference between Squealer & Kiroumaru wasn’t in their relationship with humans – Kiroumaru was quite frank about that. He would’ve turned against humans if he thought he had a chance to win. It’s just that Squealer found a method to overthrow humans faster than he did. It was more in how they viewed their own society and what they thought was a way of progress. Kiroumaru saw Squealer as someone going against basic morals and ethics, trying to destroy the very basics of their society. Squealer saw Kiroumaru as a senile old fart who couldn’t get on with the times. I forgot this – as for an alternative to “Cantus,” well, power? or even PK (that’s also used in the story). “Cantus” is the result of fansubbers arbitrarily assigning an out of place fantasy name to something that has no special name in the original, because apparently they misunderstood what the Japanese word (juryoku) meant and in what way it was significant. I’ve been using “cantus” because everyone else was. Didn’t even know it was just one fansubber’s attempt at translation. I hate it when that happens. On the other hand, do we now go against the “standard” translation that everyone knows even though it’s wrong? “If you MEANT cantus why didn’t you SAY cantus, moron?” etc. Argh. Sigh. “because a loose translation of the word is “Incantation”” – No, I’m afraid it’s not. Juryoku pretty much means “magical/supernatural power” (or “mana” in the anthropological sense but that’s not how it’s used in this story). From what I remember the subbers’ confusion was caused by the first kanji, which can indeed mean “incantation” (as in, “spell”…) but that’s not its primary meaning and not what should be emphasized at all! The author chose this word because it has an innocuous meaning but also an ominous subtext: the first kanji can also mean “curse” and as the story gets deeper and darker, the “cursed power” theme emerges to undermine the whole idea of PK being the gods’ gift to humanity. Er, sorry… ^^;; *sits on hands* It’s just that I hate it when translators do this. If you think something has a significance but don’t know what it is then either do research or play it safe. Crunchyroll uses Power with a big P.
I guess I’ll have to watch this show now, it seems much more high brow than your average show. I will say that with any war it’s difficult to pick any side that’s really “good” and to decide what should have been done, particularly in hindsight. US history is full of sometimes contradictory lessons about the right and wrong time to enter war and the right and wrong way to wage it. Even in Lord of the Rings, with its straightforward dichotomy of good vs. evil, Gollum ends up straddling the line between the sides, even if he himself didn’t intend all of what he did. I’m with kuromitsu on this one. While the reasons for going to war were legitimate (geez, frankly, the humans were just asking for this to happen), Squealer was not an enlightened freedom-fighter. When he freed his kind from the queens he could have still treated them with dignity, but instead he made them simple breeding machines. Kiroumaru, who shared Squealer’s anger and his desire for freedom, wanted autonomy rather than revenge (and was man–and I choose that word deliberately–enough to admit that others in his colony were more bloodthirsty). I can only hope that the changes Saki and Satoru plan to implement (and I’m still not certain they have the ability to, what in a society that put Squealer’s living, tortured remains on display at a war memorial museum!). They managed to save Kiroumaru’s colony, but how much more can they do? I remain unconvinced, unless Tomiko taught Saki that longetivity trick and manages to simply outlive her opposition. I might also be in a middle ground between Kuromitsu and you regarding this topic. As already been said, I sympathize, and perhaps even empathize a little, with Squealer’s justifications for war. Being oppressed and the target of racism is never a good thing, and is often erased (as seen here, through history/knowledge and even biological warfare). Squealer had every right to enact revenge upon the society that so cruelly put his people in such a condition. I do disagree, however,that his methods were right. Genocide is never an answer to oppression, or anything for that matter (I choose to see this war as a sort of light shed upon many genocides that happened and continue today in order to ‘settle’ ethnic conflicts which have gone on for centuries) and resolves almost nothing. But. It’s important to realize that at the same time, Squealer was forced to have no choice. As seen with the finale, even his trial wasn’t given on equal terms. The victors are the ones who write history and decide the game, and here, we almost see it happen again (if not for Saki, who attempts to change the future, no matter how long it takes or how impossible it seems). Almost like terrorists in this age, Squealer was forced to use such brutal measures because a.) there was no other way the Cantus users would listen and b.) the sort of cruel world that SSY exists in forces us to resort to extreme measures to survive. It’s a very grey situation, and even after seeing many arguments for and against Squealer (and the Cantus people) I still think there’s no real ‘right’ or ‘wrong’ answer. Which I would prefer the most; rarely do we see a show shed light on such controversial content without judgement, but Shinsekai managed to do it well, which is why I really respect the series and love it so much. I agree – I think the important thing here is that Squealer had a point, but then so did everyone else, from their own POV. We might sympathize with one side more than the other, but overall it’s all very gray, which is what I think makes it stand out against stories with similar themes. Wow… great to see you’re still recommending new shows. Hadn’t head of this anime. Can’t wait to DL it. Any other standout shows this season?? The only other recently-ended series I really got into was Psycho-Pass. JoJo’s is good fun, but if you’re looking for intellectual meat, PP and SSY are the series to look up. There’s been a lot of talk about violent video games going around lately, and I think Shin Sekai Yori shows a good reason why our fiction features so much violence. Other, not-as-violent methods of conflict resolution are not pretty. Enslavement, restriction of rights, and persecution have all been methods by which societies have found ways of living together with conflicting interests and goals. At some point, you’ve got to wonder whether it might just be kinder to kill them and halt the constant infliction of cruelty. When I started the last episode I thought most of it will be a nice closure episode, nothing unpredictable and then the Squealer scenes happened and so this became one of the best ending I’ve ever seen. My eyes and brain were completely glued to the screen. Then I thought, was Squealer’s character not handled to its true potential? He had this huge impact on this last episode, as he was present in it but what if he would have been around more in the 2nd half of this anime, what if they made us see all he was planning and doing, I can only wonder what the impact of this last episode would have been then. Oh well, at the end I enjoyed it immensely, I for one will recommend this anime to everyone I can. I know, right? I ended up rating SSY as 9/10 on MAL. The story and world could’ve justified at least another 13 episodes. It was a great series with a masterpiece of an ending, yet it still finished with so much untapped potential. I think it’s just as well, though. I think it’s a nice touch that we see the story through the eyes and mind of a human (or in the anime, from a human point of view), because in the end it’s the humans who are in the focus, it’s them who need to learn and change. I just marathoned all of this, and yeah, Squealer totally surprised me and became the most complex and interesting character in the show! I largely agree that he did mostly wrong things for the right reasons, but he was a really tragic figure in the end. If the hope for the new world lies in Saki’s leadership, she was just as influenced by Squealer’s actions and fate as she was by her friends. It would have created a much different narrative, but I’d be interested in seeing a show focusing on Squealer’s development instead of Saki’s. I only say this because Squealer ended up having a much more dynamic character arc than any of the protagonists, and his journey from servant to leader must have been complicated. Let’s say it like this: Imagine the anime with Queerrats and humans having their positions switched. It’s clear: What Squealer did was wrong from the viewpoint of the viewer. But even more wrong was what the humans did. Killing their own children because they fear them is in no way better than anything the queerrats or Squealer did. Actually, I’m pretty pissed at the ending. The torture Squealer received should have been given to the humans instead. They were way more “inhumane” than anything else in the series. The sad truth is, human are like that, killing everything they fear of and putting themselves above everything on the planet. Luckily, there are still human who think different.